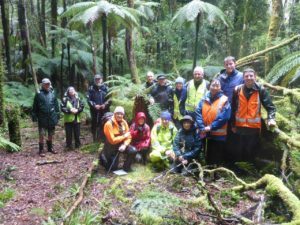 On Sunday October 8th, undeterred by a somewhat unattractive departure time of 5am and rotten weather (rain), fifteen souls headed into the wet dawn at Mokaihaha Ecological Area, approximately 10 km east of Tokoroa. 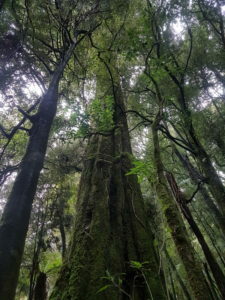 Around 2137 hectares in size, the Ecological Area is the largest surviving block of a once extensive mixed podocarp-tawa-kamahi forest which blanketed the crest and western fall of the Mamaku Plateau. 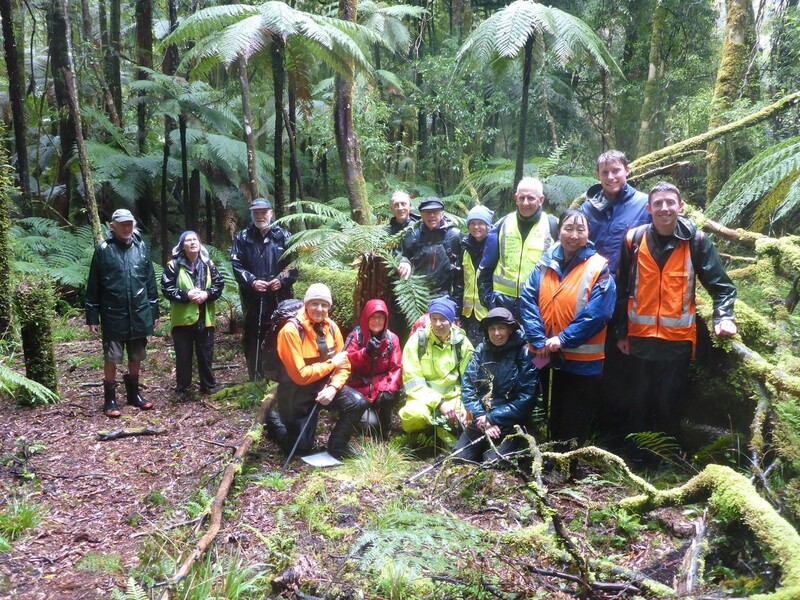 The Department of Conservation and the Mokaihaha Kōkako Trust and volunteers are undertaking possum and rat control in the Ecological Area to help safeguard the resident native fauna. 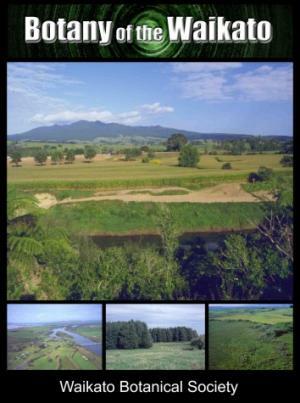 This forest is home to a range of threatened fauna including a significant population of kōkako which occupy a core area of approximately 850 ha in the north-western corner of the reserve. 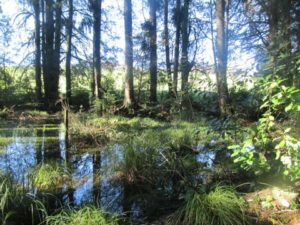 This area of forest has never been logged, so the podocarps rimu (Dacrydium cupressinum), matai (Prumnopitys taxifolia), miro (Prumnopitys ferruginea) and kahikatea (Dacrycarpus dacrydioides) still dominate as emergent giants from a mixed canopy of mainly kamahi (Weinmannia racemosa), tawa (Beilschmiedia tawa) and tawari (Ixerba brexioides). 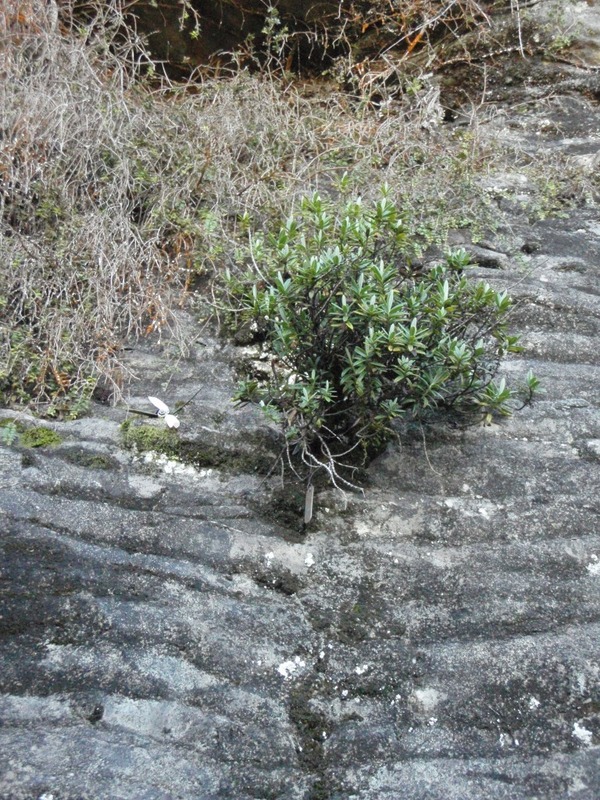 Hinau (Elaeocarpus dentatus), black maire (Nestegis cunninghamii), pigeonwood (Hedycarya arborea) also feature strongly. 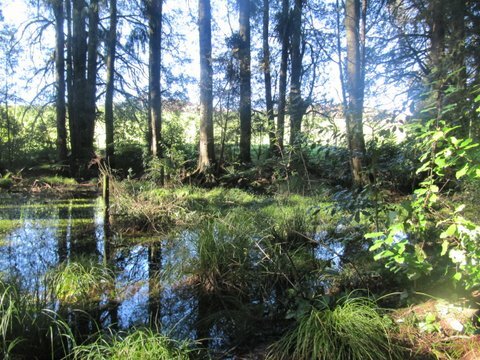 The forest understory also supports a healthy diversity of plant species including mahoe (Melicytus ramiflorus), putaputaweta (Carpodetus serratus), poataniwha (Melicope simplex), pate (Schefflera digitata), five-finger (Pseudopanax arboreus) pepperwoods (Pseudowintera colorata and P.axillaris), a range of Coprosma spp. and tree ferns (Cyathea smithii, C.dealbata, Dicksonia squarrosa, D.fibrosa). 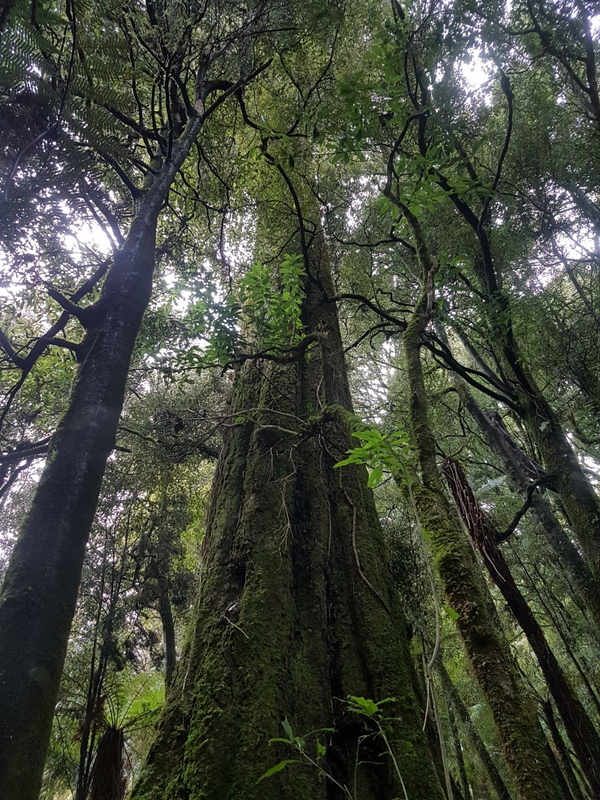 Almost every trunk and fallen giant also abounds with a rich diversity of epiphytes and climbers (supplejack – Ripogonum scandens, bush-lawyers – Rubus spp., native jasmine – Parsonsia sp., rata vines – Metrosideros spp. 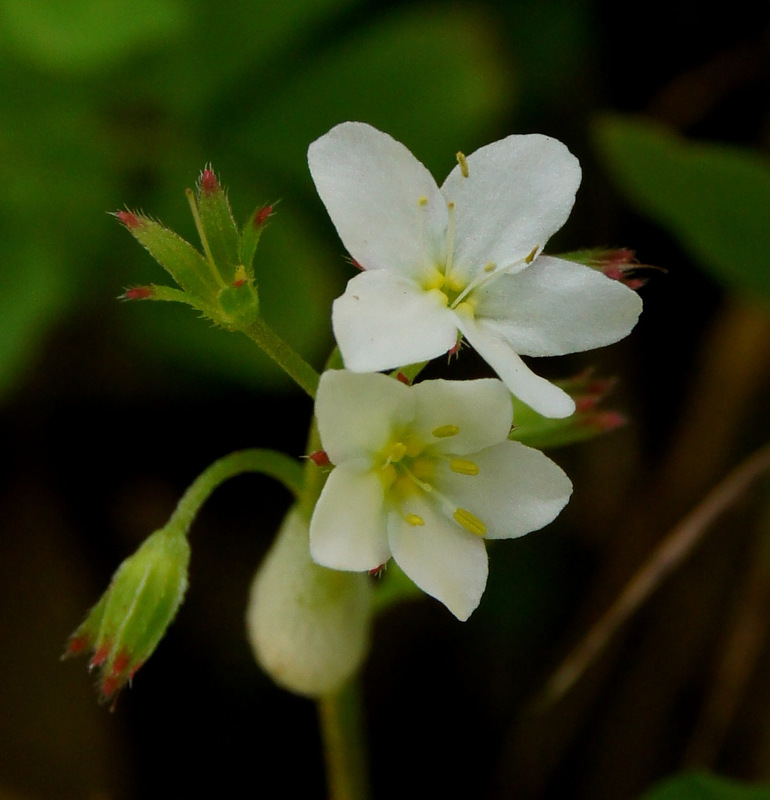 ), filmy ferns (Hymenophyllum spp. ), mosses, liverworts and lichens. Photo (C.Beard) one of the many giant podocarps in the Mokaihaha Ecological Area (this one a kahikatea). 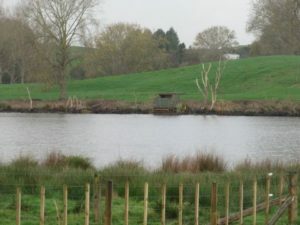 As the countour of the area is relatively flat we had to be careful not to become too botanically distracted in the dull light and falling rain; relying on marked bait lines to eventually guide us back to our starting point on the western boundary of the reserve. The trip was not only enjoyable from a plant perspective; much to our delight it was the rare treasure of kōkako song that accompanied us early into our walk. Over the course of the day kaka, whitehead, grey warbler, morepork (and even a black-backed gull) also made themselves known. 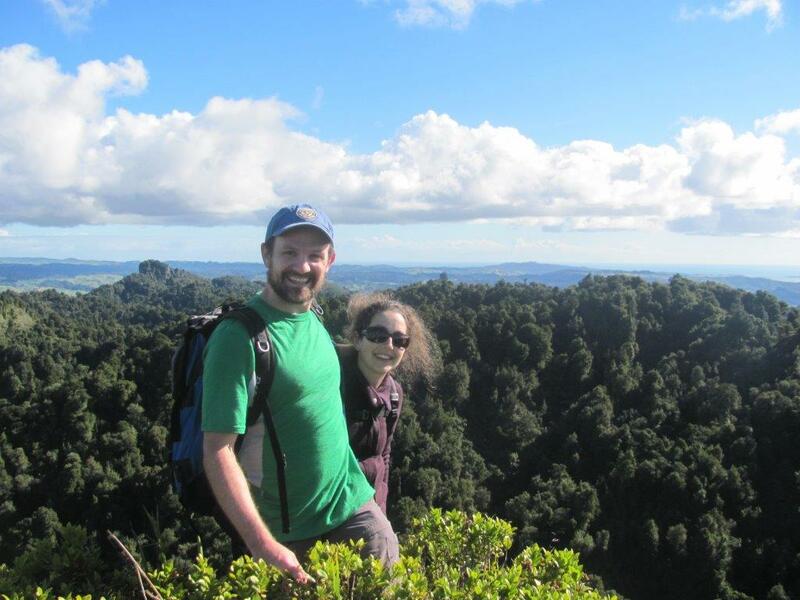 Thanks to Katherine Hay (Project Coordinator Mokaihaha kōkako recovery project) for organising the trip and keeping an eye on the wandering botanists! 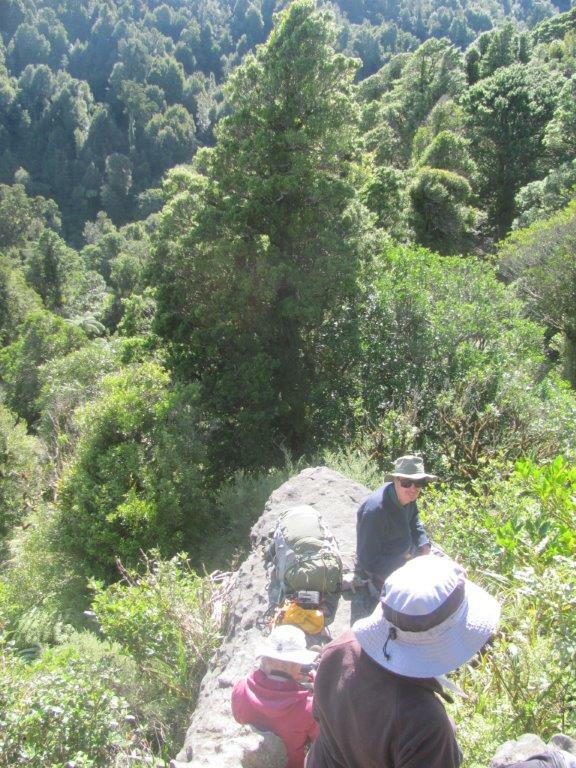 Eight keen botanists visited Rock Peak on a beautiful Saturday to seek out the locally uncommon Hebe scopulorum, a shrub known only from the limestone peaks from the Waitomo region. Thomas Emmitt led us through the private farm track and up to the peak. After descending to the river bottom following a farm track, we meandered our way to the top of the peak following a loosely defined track. The lower slopes were regenerating forest, but the higher we climbed the forest became more mature, where large tawa, hinau, and some rimu dominated the canopy. We compiled a species list, which will be posted at a later date. We also saw Asplenium lyallii, a limestone specialist, on the outcrop. 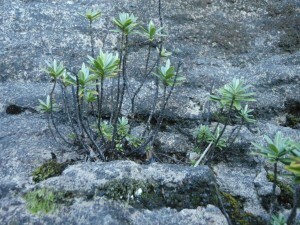 It was a great day in the bush with good company and beautiful plants. 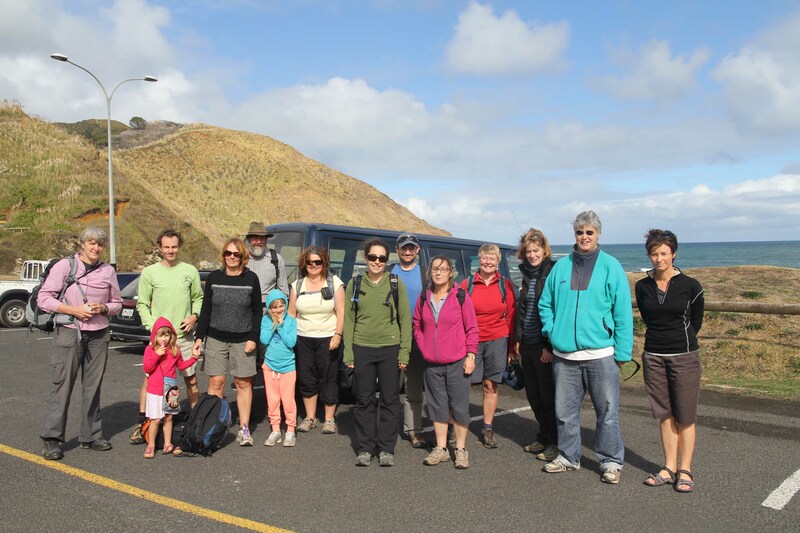 Today thirteen botsoc members and two from the Port Waikato Beach Care group gathered at the wild west coast beach of Port Waikato to botanize the dunes at the mouth of the Waikato River. 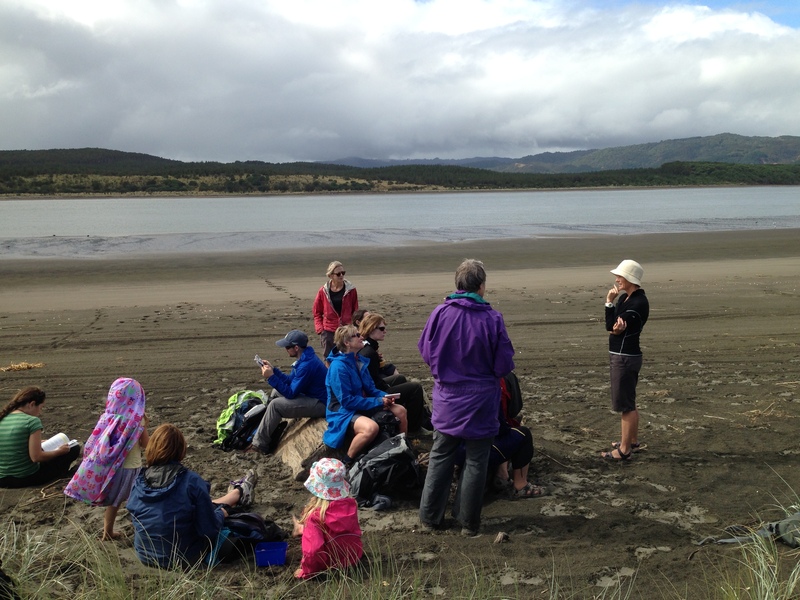 The day began with a 40 minute walk along the beach to the end of the spit where we stopped only to peruse an old dead seal. We started at the far end as the dunes are younger and have few exotic species. 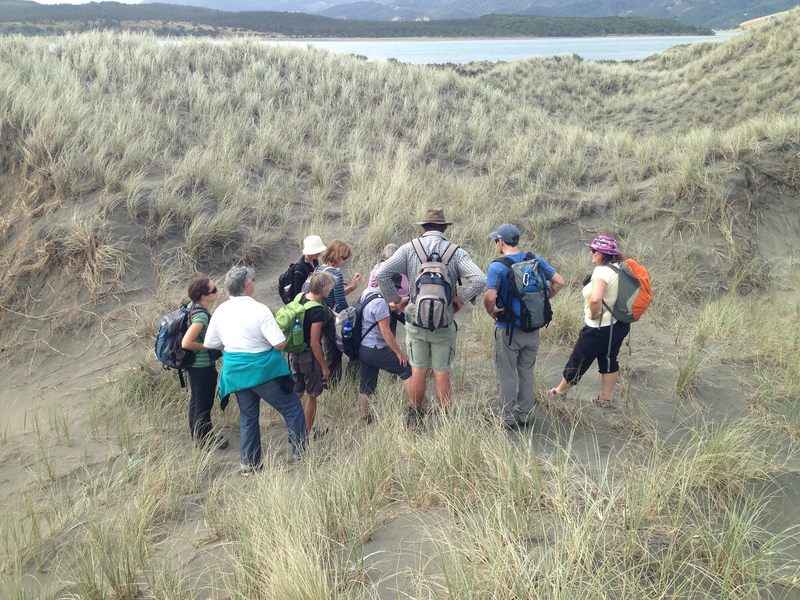 Catherine Beard, the trip leader, gave us a rundown on the amazingly hardy native sand grass, spinifex (Spinifex sericeus) which dominated this end of the dunes. 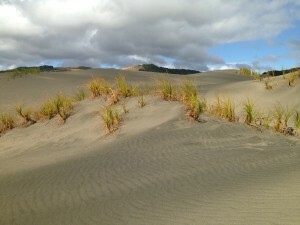 Tauhinu (Ozothamnus leptophyllus), sand wind grass (Lachnagrostis billardierei subsp. billardierei) and knobby clubrush (Ficinia nodosa) were also present amongst the spinifex dunes. During lunch, Karen Opie from Port Waikato Beach Care filled us in on the birds that frequent the dunes and the work they have been doing to protect them. One of the most exciting recent events for them was a visit from several fairy tern whose current population is only c. 40 birds in New Zealand. 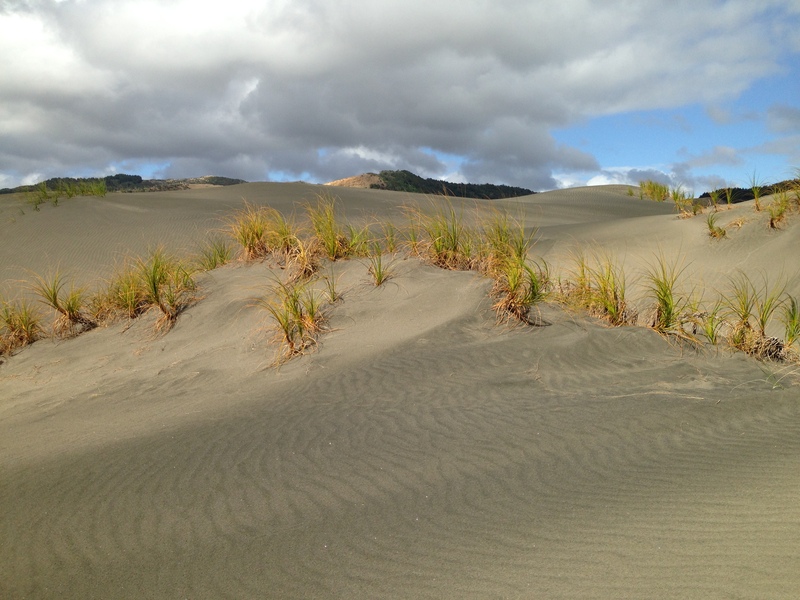 In the afternoon we headed towards some of the most mobile dunes where there were several populations of pingao, classified as At Risk-Declining on the most recent NZ threatened plant list. 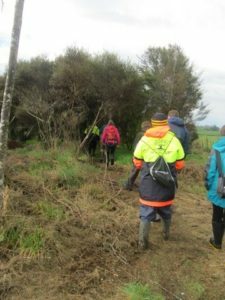 The day ended with a walk back through the dune slacks, and a viewing of the Port Waikato Beach Care restoration planting. 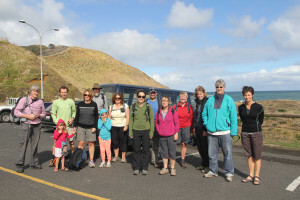 Thanks to Catherine and Karen for a great day out.